The Pleiades are a prominent group of stars, easily spotted in the northern hemisphere night sky. If you have keen vision you may be able to make out seven stars although the cluster contains over 1,000 confirmed stars. These stars are young, hot and blue and are travelling through a region of dust and gas which reflects the light from the blue stars giving us this faint blue wispy hue. 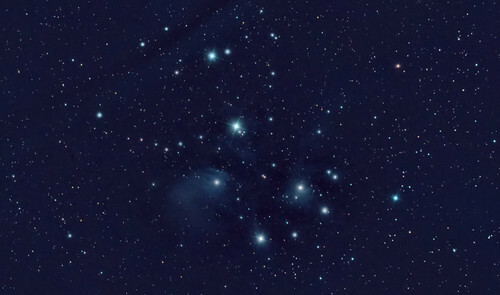 The name “Pleiades” comes from ancient Greek mythology and refers to the seven celestial sisters who all became mothers of various Gods.